Anonymous devotee of Shirdi Sai from USA says : Sairam devotees, I sincerely lack words to describe what to pen down. I do not want to think and write something. I just want it to be flawless and let all the words come from deep bottom of my heart. I am being used as an instrument by our Sai. Sai, please keep me honest, simple, humble and fully devoted through my thoughts and words. Please will it. I am also a part of the mahaparayan. Myself being selected in the MP is Baba’s leela because He selected me a month later and I was just waiting for His call. It is always true that not even a leaf or grass moves without His will. We devotees are so foolish and funny that we tend to think all is happening because of our doings and this creates a sense of ego, jealousy, pride, guilt, weakness. All is His will. We will not get it until we are favored with His timings. Anonymous Shirdi Sai Devotee from India says : I am from Chennai. I wanted to share my Mahaparayan experience with you all. Thank you Pooja ji and Hetal ji for this wonderful opportunity. Recently my mother was diagnosed with lungs problem. We were praying a lot to Baba to cure her lung disease and finally we got a good doctor. 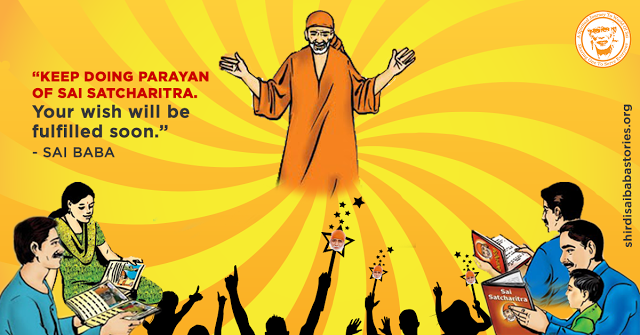 Though it will take time to get healed completely, we always believed that Baba will definitely cure her. One day early morning she got a dream in which air bags which were in lungs were moving slowing in front of Baba's picture and after that dream we got a good doctor. Sorry Baba for posting this experience so late. Baba is the biggest doctor - Doctor of Doctors; Who can cure any fatal and incurable disease with His Udi and blessings. What Baba needs is complete surrender on His feet with faith and patience. And He expects this only as only fees. Love You Deva Jai Jai Ho Sai. Shirdi Sai Devotee Smithaji from India says : Myself Smitha Karane from India, want to share an unbelievable leela of Sai with me, which reconfirmed the power of Sai Satcharitra parayan. The leela goes like this. I was a very new member in Sai Satcharitra parayan, who had just started doing daily parayan. One fine day I joined Facebook. I liked a Sai Satcharitra page on facebook. From then I started getting many Sai images and thoughts which made my each day beautiful. After 2 days of liking this page for my surprise I received an image of Sai below on which it was written as " I Will Visit Your Home ", which I initially ignored, but to my surprise again after some days I received another image of my Sai with message that " I Will Meet You ". Shirdi Sai Devotee Kakali Dasgupta Saha from India says : Sairam dear all. My namaskar to all the readers. Thanks to Pooja Ji and Neha Ji and all other admins of the wonderful site. My name is Kakali Dasgupta Saha and I am from MP-210 Mahaparayan group. Before I had shared couple of my Mahaparayan experiences, which have got posted on Mahaparayan Blog too. I wanted to share my third Mahaparayan experience, a wonderful Leela of our Dear Baba with everyone. He is truly the Omniscient, Omnipresent, Inscrutable Sai. The Lord of all His devotees, the Love of all His devotees. We just have to ask Him with a clear heart and He will listen instantly. Today a wonderful thing happened with me. I had gone to Baba temple in the morning around 10 with my husband. So we bought a pink rose and a lotus, offered them at Baba's Holy Feet and came down from the Sanctum Sanctorum and sat inside the Mandir. We both were praying and chanting. About 7-8 minutes passed. There were few devotees who were also sitting there. I was re-reading the book "Sai Baba is still alive" by our Di Jaan Jaya Wahi Ji. So there is a chapter in which she mentions how her rose was accepted by Baba on His Holy Crown. So all of a sudden I had a thought that I could request Pandit ji to place my pink rose on Baba's pagdi. Anonymous Shirdi Sai Baba Devotee From India says: Sai Ram, my wholehearted Pranams to You and all the wonderful volunteers and devotees. I’m from MP-48 group and just wanted to share two more beautiful experiences of our lovely darling Baba. Two days back, I was casually replying to a message from my manager on the office whatsapp group and was slightly worried that it might have sounded a little sarcastic and rude. And as always whenever I feel uncomfortable, I talk to our Baba and ask Him for guidance. And then I texted my manager on his number casually and then everything was ok. I was so relieved and thanked Baba immediately for His guidance and help. Anonymous Shirdi Sai Baba Devotee From US says: Sai Ram, I have been waiting to write my leelas and experiences of Baba for last 2 years. Thanks for providing me the opportunity to derive, connect , understand and finally write about Your leelas Sai Ram. I’m certainly blessed to be inspired by so many experiences from devotees in this forum. Thanks again for providing the platform to share our leelas and inspire many more. I currently reside in the USA and have been a staunch devotee of Baba for the last 4-5 years. I have been married for more than 5 years. Just after my engagement, my dad passed away and I was burdened with tons of responsibilities. So we made a conscious decision to push having kids of our own until things settle down. When we finally wanted to have kids, we couldn’t conceive.After doing many vrats and parayanas my wife conceived to the joy of everybody. However, this wouldn’t last for long as we had a miscarriage and were totally devastated. To add to this, I had to leave out of town for my project work and couldn’t be there to support emotionally. Shirdi Sai Devotee Susama from India says : I am a member of Mahaparayan group MP-326, roll no 9, red house. I have little faith and little doubt in Sai. Still life is going on smoothly due to Sai’s blessings. I am a school teacher by profession. Copy of student is very important for us. I lost one of the copies. It would be 3 or 4 days. Principal, student and parents said that I had the lost copy. What my mind was thinking that I don’t know. I thought Sai must help me and why should I worry for this? Shirdi Sai Devotee Lakshmi Ajay from India says : I am a member of Mahaparayan group. 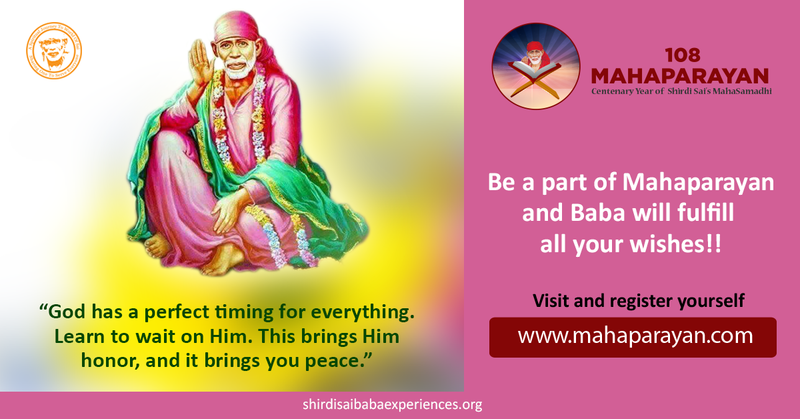 It has been 22 years since Sai Baba came in to my life. I was suffering from heavy to tonsillitis and allied side effects for the last 2 weeks. I had to take the antibiotics also twice. As a result last Wednesday onwards I was suffering from itching all over the body. I tried simple medication. But it didn't get subsided. Shirdi Sai Devotee Manjula from India says : Om Sai Ram. I am Manjula from Chennai. Dear Sai family, before I had shared my Life saving experience with you all, which have already been published on the Mahaparayan Blog. Now I would like to share another leela of Baba with you all. Yesterday night as usual we all finished our dinner and children went to bed. Daily I used to write 108 times or more Sai namas of Om Sri Sai Ram as I am in Saikoti group. So yesterday also I wrote the Sai namas and normally before going to bed I used to check the cylinder to be in close (off) mode. But yesterday unfortunately I didn't check it and I went to sleep around 10:30 pm. Shirdi Sai Baba Devotee Aparna From India says: Sai Ram, I am Aparna, from MP-568 group. I would like to share a beautiful experience with you which shows that our Baba always love His devotees very much. The miracles that Sai does in our lives are so unexpected and surprising which always brings us immense joy. Few days back we (with my family) went to Shirdi on 13th September. We had booked online aarthi tickets for dhoop aarthi. As we know that gents and ladies lines are separated at the time of aarthi, I was in ladies line and I could not advance forward and ended up near a pillar from where I could not see Baba properly. Shirdi Sai Baba Devotee Laxmi From India says: Om Sairam, Sri Sairam, Jai Sairam! I'm a small devotee of Lord Sai Baba. I'm doing a job in MNC which is Baba's blessings. I went for an interview on Thursday and got selected the next day. I prayed that I should get reporting day as a Thursday. And yes it happened. I joined and forgot about the things which I had promised to Baba. I suffered a lot in the office. My life was full of fake people, criticism, pain and at the end situation came that I even lost my job due to office politics. I gave my 100% and was top in the team, but because of people who didn't like me gave bad feedback to manager and it ended in losing my job. I fulfilled my promises and again asked Baba to give me one more job. Shirdi Sai Baba Devotee Ria Kumari From India says: Sai Ramji! With Baba's blessing sharing the below experience for which I have been waiting to share at the right time and now it's the right time. Last year Nov, 2017 I went to a gynecologist as I was facing some issues. Then I told the doctor that we were planning for a baby as well. Doctor asked me to do some tests in which one of the test was for AMH level (for checking egg reserve). When I got it tested, the results were very poor. The doctor was shocked to see the results as she had never seen such low levels at my age (31 years). She then advised me to get the test done again from some other path lab but the results were still the same. According to the results the doctor told that I would never be able to conceive normally and if I conceive normally it would be a miracle. So I will have to go for either for IVF or donor egg(as the results showed that of a woman at menopause). Shirdi Sai Baba Devotee Shruthi Iyer From India says: Sairam to all the Sai devotees and a sincere bow to Your holy feet my Deva. I Shruthi Iyer would like to share my experience which happened last week with me. I had appeared for post-graduation exam and I didn't get the expected the result. Initially I was upset, where I had no option to go for premier college and even few colleges rejected my profile due to less score. Some called for more donations around 2.6 per year. I was dejected for being late and pleaded Baba and took my Satcharitra. I started reading almost a week seeking Him to put me in some good college in government quota. Shirdi Sai Baba Devotee Arathi Gorur From Germany says : Hello to all Baba's devotees. This is Arathi Gorur from MP Europe -81. This is my 2nd big and blissful experience that I wanted to share with you all. I have earlier posted about how Baba made me go to Germany and start a MP-group there which was only possible due to His grace. Now I will tell you how He fulfilled my wish to travel to India in the month of May 2018 and also fulfilled many other wishes inside the big wish of suddenly sending me to India from Düsseldorf, Germany. The other wishes were: attending my cousin's wedding, visiting Shirdi, spending time with family in Bangalore as it had been more than 2 years since I visited there. The chances of me going to India specially in May 2018 were very bleak because my husband didn't have many leaves left and we were already spending a lot of money and time, taking trips to many places in Europe and Japan. I was praying to Baba from mostly November 2017 that somehow just make us visit India Baba. I have a list of things and You know they are genuine. On one Thursday, I was thinking too much about it and in my parayan chapter, there was a mention about Mr. Cholkar giving up sugar in tea for a while. I immediately prayed to Baba saying From my side Baba, I will pray for the opportunity to go to India amidst all our crazy travels and my husband's shortage of leaves and practically not being possible to make a trip. You know that I love sugar in my coffee, milk, tea, still I will leave it for 21 days. Then after a few days I had this thought in my mind that even if I couldn't go to India, I won't be angry with Baba. I will still stay strong and give up sugar with all my love. Shirdi Sai Baba Devotee Subha From India says : Om Sairam. This is a recent experience our family has been blessed with. First of all I am really blessed and thankful to Baba for selecting me also to be a part of Mahaparayan group. When reading every week for parayan I will have some prayers to Baba and will plead Him to fulfil the prayers. I had been praying for my brother so that he be blessed with a good job. He had been searching for some months. Since all his friends got a job he was becoming worried that still he didn’t get any job. He was attending interviews and getting through till final round but was still not getting the job. Recently he went to a very good company. Baba had selected for him by a friend of us. He went there till final round but said that he was on hold. We were having hope that he would get it for sure but we were told that he was on hold. Shirdi Sai Baba Devotee S. Roy From India says : I am S. Roy from MP-16 group. I want to start sharing my experience by giving thanks to our Almighty God Shirdi Sai Baba for all the good things happened in my life till today. Generally, whenever any good happens or my wishes are fulfilled I thank Gods including Him. I came to know about Sai Baba in 1987 beginning when my father became critically ill, from one of my office colleague. I am really thankful to her also. There are many events which made me stick to His holy feet and believe Him as "Trata" (saver). Now I am starting to share my experience. My daughter went to US for pursuing MS immediately after completing her B.E. She could get the admission in a very good university and was performing very well during the course. During her vacation, she was trying for internship, but not getting suitable one as she was not having any work experience. Ultimately she got internship in a small company, but just before joining, the company faced some funding problem and cancelled her internship deal. Due to this sudden cancellation my daughter became very upset and nervous. Then I started Sai Divya Puja for seven weeks and also promised to join Mahaparayan group if she gets internship in US (At that time only the Mahaparayan idea had just got published in "Devotee's experience" site). After 5th Thursday Puja, she got an Internship in a very good company for more than 4 months. I was overwhelmed for these blessings from Baba. Then I also enrolled my name in Mahaparayan group. After starting Mahaparayan, I got my job too in a suitable post which I was trying since last 6 months. Shirdi Sai Baba Devotee Anita From India says : This is Anita from MP- 52. Being in this group itself is a miracle. I was not completely aware of being added to this group but finally I was in this group. This was the first miracle that Baba revealed me. Inspite of this I always used to think why Baba is not airing me His miracles whenever I used to read others’ experiences. Finally I was showered with numerous experiences. My daughter dropped her B.Tech first year and was back home and she had an intense desire of going to US for undergrad but I thought how was it possible. Shirdi Sai Baba Daughter Veena From India says : This is Veena. I'm from MP-210 Laveena Sai Group. I'm so blessed to be part of this global Sai Satcharitra Parayana. I was asked if I would be interested in reading Sai Satcharitra in a group by one of my good friend Sumana in India, to which I had immediately replied yes! It was a Thursday early morning when we had this conversation about the Global Mahaparayan. The same day in the evening a person by name of Preeti from India called me and said she would link me to a group leader who would assign me chapters to read and I could start from the next week. It all happened so fast that before I knew I started reading Sai Satcharitra from March of this year as part of Laveena’s group. Ever since I started reading it, I have felt a sense of calmness. 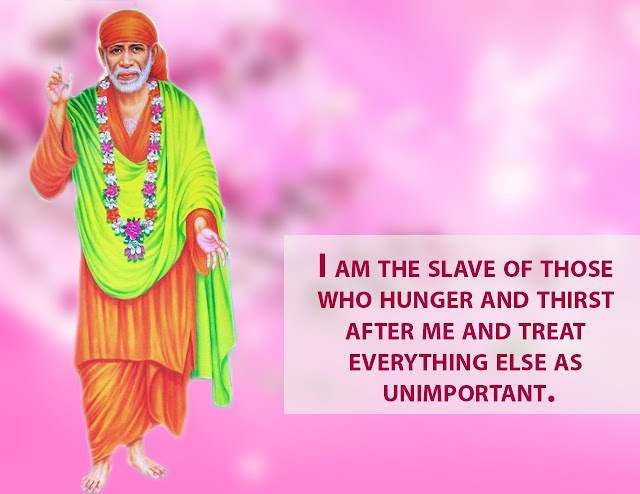 I notice I'm always not so worried or upset and have been entrusting all my things to my Father Sai Baba. I talk to Him daily and say You are my Father and You know what's inside and outside of me and what is best for me and of course lots of good things have been happening in my daily life. All the hurdles, little problems and some big ones have got resolved by itself without any difficulty or intervention. I thank my Father daily for this. Shirdi Sai Baba Devotee Dr. Shimali From India says: Dear all, Sai Ram I'm Dr Shimali Sinha, Roll no 12 of MP 23 Sukirty Parayan group. I was thinking of sharing this miraculous twist of my life which I have been going through since last 12 years of my marriage. I will keep it short and simple for you all to understand. My daughter 10 years old has been staying with my parents as I was busy with my post-graduation studies and job matters, moreover being the only daughter of my retired parents I was happy that both were complementing each other. My husband is a surgeon having a roaring practice in rural Bihar. My parents stay at Ranchi which is known for its good schooling. l used to keep on roaming between the three places- my work place, my husband's place and my parents. Anonymous Shirdi Sai Baba Devotee From India says : Om Sai Ram. I would like to remain anonymous and share my Mahaparayan experience. It is about how Mahaparayan Changes my life through reading with love, commitment and devotion. I started reading for Mahaparayan through this wonderful soul I met a year prior. I introduced her to a Sai Ashram in the area as she was not from around the area and did not know of any Ashrams in the area. She was also a Shirdi Sai devotee. I guess I am mentioning this because I believe Swami works in mysterious ways. He brings people into our lives for a reason. I started reading forMahaparayan in September 2017. I was very unhappy and frustrated at work. People were taking advantage of me and using me for their benefit. My supervisor was earning way more than me but I was doing her job. Eventually it was becoming too much, the work environment was not at all conducive. In addition my then boyfriend now fiancé was and still is in another Province. My mother had a gambling problem. The strain at home was even becoming unbearable. I started reading Mahaparayan with no expectation. I just did it and continue to do it with my heart and my love for Swami. Shirdi Sai Devotee Muskan from India says: Sai Leelas are anant. Sairam everyone, I am from MP-23 Sukrity Mahaparayan group. Today I had gone to the eye doctor with my maa and paa for my maa's eye check-up. 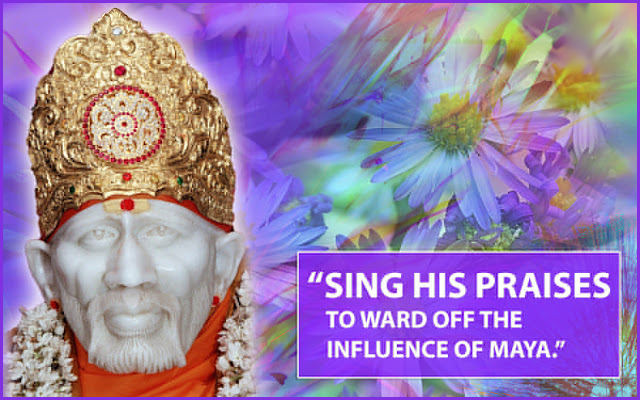 Sai bhaktas always pray to Sai to show His presence wherever they go. In similar manner I too had such requests to Deva. Sitting there we were waiting for our turn, all of a sudden I saw half, a big framed picture as sitting in red colour dress. I thought it's Deva but when I saw clearly it was not our Sai Deva. It was the picture of other Saint Mehi Daas. I got very upset thinking that Baba is not around me. Shirdi Sai devotee Radhika Kyama from USA says: Sairam everyone. 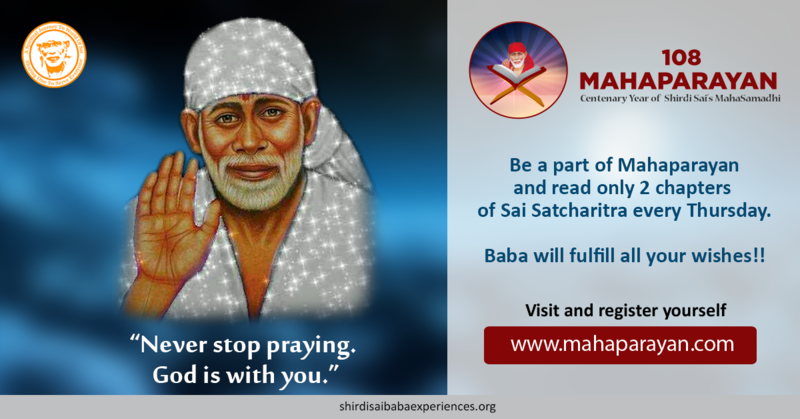 My name is Radhika and I want to share a recent experience that happened during Mahaparayan, how Baba blessed my brother to overcome his health issue. Me, my brother and my mom we all are Baba's devotees. Since few days my brother's health was not good. He was often getting fever, body ache and all kind of health issues. He kept on going to the doctor and getting antibiotics and was getting well. Doctor suggested him to do blood test but he was very scared of it and was kept on postponing it. Recently my mom did Nava Guruvar Vrat and after that also he was not well and again he visited doctor. Shirdi Sai Baba Devotee Sivani Erukala From India says : Sai Ram Pooja Ji for bringing up this awesome group of Mahaparayan which gave me immense support in every situation. I am an ardent devotee of Sri Sai Baba since childhood. We used to visit Shirdi since my childhood as my dad was also an ardent devotee of Sri Sai. My whole family and friends around are great devotees and thank you all of you for making this platform successful with the blessings of Sri Sai. I had many experiences in the past but wanted to post the latest experience which happened last month while I was doing Nav guruvar Vrat. Usually after the puja is done and reading Satcharitra I take picture of Sai Baba as I like to decorate with completely yellow flowers. I started taking pictures and kept my phone in portrait mode with no filters and suddenly I experienced Baba was giving Udi in the camera. I was so overwhelmed with Joy and happiness and with tears in my eyes took the picture of Baba and the photo came out to be blurred. I am attaching the picture with this experience. I see Baba in my everything and my family believes Him so much. We got a new house after completing Sai Nav guruvar Vrat and very happy to be a part of this Mahaparayan Group. Raja di Raja Yogi Raja Parabrahma Sachidananda Samasta Sadhguru Sainath Maharaj Ki Jai. As is our faith so is Baba’s response. He always acknowledges anything done with love and devotion no matter how small or big it is. Love You Deva. Jai Jai Ho Sai. Anonymous devotee of Shirdi Sai Baba from India says : Om Sai Ram. I want to share Baba’s Miracle. I was unemployed in early 2018, despite being qualified and having good experience finding a job in the place I am was very challenging. 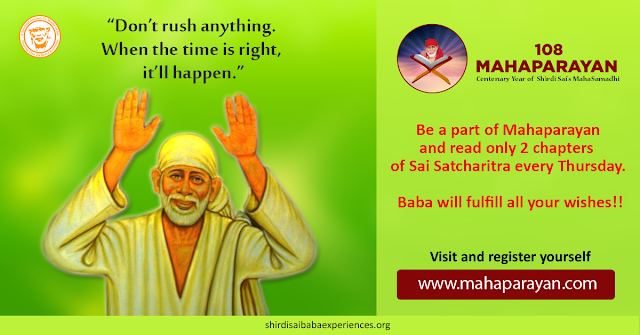 During this time I came to know about Sai 9 Guruvar Vrat through devotee’s experiences with Shirdi Sai site. I decided I can either keep feeling bad about my current situation or divert my energy and focus it on Sai and continue praying. I attended an interview prior to 9 guruvar vrat and by 3rd week they confirmed that I was the final candidate and they would work on some internal approvals. But this kept delaying. Around week 6 of my 9 Guruvar vrat I also started Sai Satcharitra parayan and within a week Baba blessed me with a contract job. I was happy about getting that but the job being a contract, there were no benefits and it was much lower than the job I was doing earlier, in terms of position and pay as well. I kept asking Sai why He would show me an amazing opportunity, not give me that but would try to settle me done with a lower level job. This troubled me for almost 2 months. Anonymous devotee of Shirdi Sai Baba from India says : Om Sai Ram You are my everything. I don't know how to thank You. I am so sorry Baba for sharing my experience very, very late. Sorry and please forgive me. It was only possible only because of you Baba. First experience:- It was the biggest experience of my life. Just because of Babaji and Shiv Baba ji I got engaged to the person I love. 6 months of fights, arguments with full faith and patience and my wish is fulfilled. My family was against our marriage. I am a manglik girl and he is non manglik. Our gun milan was also 13. I was always thinking negative that if I get married to him and something bad happens then what will I do. But each and every time Baba proved me wrong that don't trust astrologer’s horoscope, believe Him and I got the result. Yes nothing is impossible for Him, only faith and patience can lead a successful life. I did 11 weeks of Sai divya pooja. Last day my boyfriend called my mother and she agreed to meet the family and miracle of miracles happened. Everything was done smoothly, happily and without any arguments, fights both the families are happy with the decision as it is only because of Baba. Shirdi Sai Devotee Susama from India says : Om Sai Ram. I am MP group member roll no-9, I am a small devotee but a doubtful devotee too of Sai. Last night I dreamt three kids in form of Sai gave me 5 or 6 flowers and peda, a sweet dish wrapped with so many papers. When I opened 5 or 6 papers at last I found a peda. When in morning I started reading my allotted chapter 9 and 10, what I read Tarkhad ji’s story about sending sweet peda by some one. Shirdi Sai Devotee Susama from India says : Om Sai Ram. I am Mahaparayan group member roll no-9. I have realized many miracles in my Mahaparayan time. Last Thursday I got a chapters of chandan yatra and Urus celebration. I am a school teacher by profession. In our school for 7 days due to some problem water supply was stopped. We faced a lot of problem while using washroom. Bad smell and unhygienic condition were troubling us much. On Thursday morning while I was reading I read one line that Sai solved water problem by dropping flower for mela celebration. Then when I entered what I found that water supply had started once again. I feel really blessed. Next miracle was that I had promised my student that I would show him a powerpoint on my subject . I had faced a lot of problem preparing it. Then lastly I got a cyber cafe whose name was Sai. My pendrive also was not supporting me and cyber cafe owner tried to help me but due to not so good knowledge about ppt . At that time a unknown boy was sitting near to me and he helped me to prepare it. When problem arises I call out for my Sai and He always rescues me. I was able to show my ppt amongst students and Sai Baba helped me keep my promise amongst my students.Thank You Sai. I am always doubting You but You love me a lot. Om Sai. Thank you Hetalji and the team behind this divine blog. When we surrender we start experiencing His leelas. Every chapter that we read as per allocation for Mahaparayan it is actually what Baba wants us to read. Unfathomable are His leelas beyond our ken and intellect. Love You loads. Jai Jai Ho Sai! Shirdi Sai Devotee Padmaja Sajjan from US says : Om Sai Ram. I'm Padmaja Sajjan form Ballard. I have a habit of keeping Baba's Vibhuti at home every time as I apply that on the forehead. On Wednesday night in between 12.30 - 1.00 AM, that means Thursday early morning my hubby got severe stomach pain and I didn't have any medicine at home. I gave him buttermilk to drink, but the pain remained the same. I was helpless. Shirdi Sai Devotee Stuti Nath from India says : Om Sai Ram. This Saturday morning , I had been to a Honda service centre for my vehicle's servicing and it is just next to Sai Baba temple, so I had also taken His blessings in morning. It was a usual Saturday evening, when I had been to get the vehicle back from the service centre. But I had no idea how I dropped my phone there. I realised only after half an hour that my phone was missing. I kept chanting Sai Naam. Shirdi Sai Devotee Sulochna Satpal from India says: Om Sai Ram. First of all a load of thanks to Pooja ji who started this Mahaparayan with Baba’s grace. I’m a member of MP_21 group and it is a miracle in itself that I’m a member of this mahaparayan. It’s only Baba Who does these types of miracles. He has done many many beautiful changes in my life or say miracles. I’m here to share one of my experience during Mahaparayan. My brother was stuck in a very big legal case for about 3.5 years and this was the only wish I had always requested to Baba to sort out. He could be imprisoned for about 10 years if we lost this case. During this period after about 1.5 years we visited Shirdi for the first time and I asked my brother to join us. Firstly he refused to go and he said that God is one and everywhere then what’s the need to go anywhere. I told him that yes you are right but you should go Shirdi once and get the positive energy of Baba from there and see the miracle of Baba, how He changes your life with good and positive things; and so he came with us.